As the debate over gun control heats up across the country, in Texas, we are working hard to make our colleges safer. 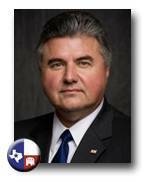 This week,Texas State Representative Allen Fletcher (R-Cypress), a retired Houston police officer, introduced the "Campus Personal Protection Act". This bill, (HB 792) is the companion bill to a bill introduced earlier in the Texas State Senate by Senator Brian Birdwell (R-Granbury). This bill is not only an important step to improving safety in the event of a mass casualty situation like what happened at Virginia Tech, it is also important for the personal safety of many students, teachers and other employees who must oftentimes walk to their cars late at night in dark parking lots. Fletcher has been selected by Speaker Joe Straus to be Vice-Chairman of the House Committee on Homeland Security and Public Safety. "As a retired Houston Police officer, I know that officers cannot be everywhere at all times. Campus police cannot be in every classroom or academic building. That is why I strongly support the right of properly licensed citizens to carry on college campuses," Representative Fletcher said. "The fact is that these are adults who are trained and licensed to carry a concealed weapon for protection. As we have learned in the past, 'gun-free zones' have not been absent of crime and have only been successful in disarming law-abiding citizens. 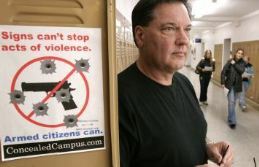 We must afford citizens the right to protect themselves." Alice Tripp with the Texas State Rifle Association supports the bill. "We recognize and thank Rep. Fletcher for taking on this important personal protection initiative. Adult students, faculty and staff with concealed handgun licenses should not be denied an important option for personal protection as they move about their day-to-day activities, including while attending classes in Texas colleges and universities. There are no crime-free zones." The bill would remove the criminal prohibition of the possession of concealed handguns by license holders on the campuses of public or private colleges and universities. To obtain a Concealed Handgun License (CHL) in Texas, the applicant must be an adult over the age of 21 (with the exception of military personnel), and upon completion of classroom instruction, pass a written exam and a shooting proficiency test. The applicant must then submit the paperwork to the Department of Public Safety for state and federal criminal history background checks. The Department of Public Safety also monitors those currently licensed to ensure their continued eligibility. Under current law, license holders are prohibited from carrying a handgun in academic buildings and dormitories. However, guns are already lawfully carried on university and college campuses; students and faculty with a CHL may carry on campus grounds, including parking lots and sidewalks. Individuals may also lawfully keep a gun in their vehicle parked on campus, with or without a CHL. Many students over the age of 21 live off campus where they can legally keep guns in their homes and apartments. The Campus Personal Protection Act will continue to allow institutions of higher education to prohibit concealed firearms at college sporting events. This bill would not alter current law prohibiting CHL holders to carry in hospitals, bars, and churches located on campus. In addition, private institutions of higher education may establish rules relating to CHLs on their campuses. Texas is currently one of 21 states that prohibit concealed handguns on public campuses. You can check on bills filed by going to the Texas Legislature website.